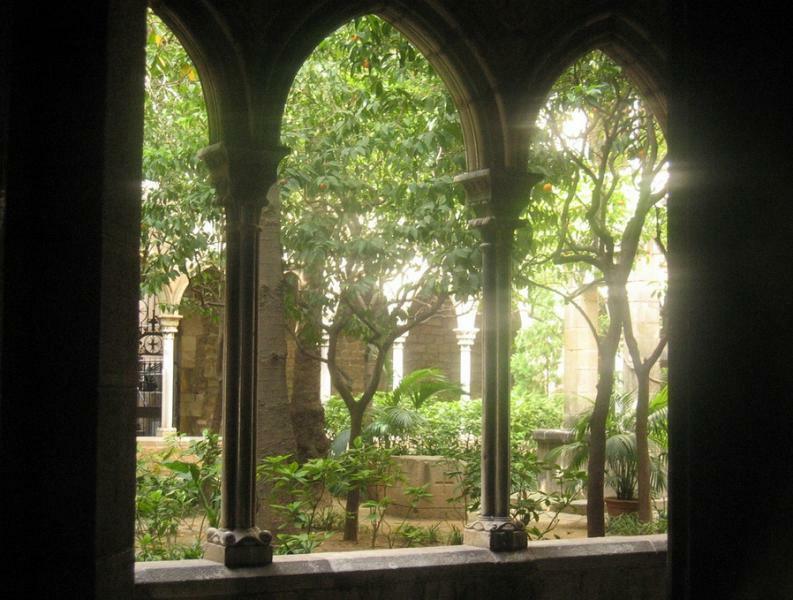 Tucked like a pearl among the oysters in the streets nearest the Plaça de Catalunya is the simple Romanesque church and elegant double-decker Gothic cloister of Santa Anna, enclosing a quiet, secluded garden with a tinkling fountain. Founded by the Knights Templar in the early 12th century, the church hosted the Corts held under Fernando the Catholic – the last parliament before Aragón and Catalonia were tacked on to Castile. Modified over the centuries, and further damaged in the Civil War, there’s not much to see inside the church, although, outside, one of Barcelona’s last surviving roadside crosses, surrounded by a circle of saints, adds a picturesque touch. Today headquarters of the Knights of the Holy Sepulchre of Jerusalem, the church is frequently used for Spanish guitar concerts. At 21 C/ de Santa Anna, the Casa Elena Castellano by Jaume Torres (1907, now a hotel) has a floral theme; the vestibule is a lavish garden of stucco, ceramics and stained glass.